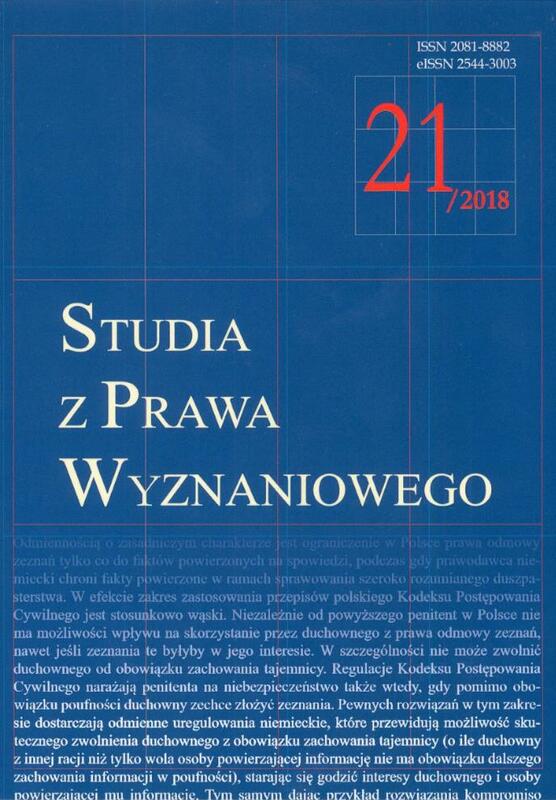 Studia z Prawa Wyznaniowego (The Studies in Law on Religion) is an annual journal published by the Faculty of Law, Canon Law and Administration of the John Paul II Catholic University of Lublin. It aims to publish scholarly articles on the legal aspects of religious freedom as well as relations between the state and churches (especially the Catholic Church) and other religious denominations. The journal gives special attention to Polish law on religion. However, its coverage also encompasses issues related to the laws of other states, the legal regulations of the European Union and the international legal protection of freedom of thought, conscience and religion. Besides research articles, the journal also includes book reviews and reports of conferences dealing with law on religion. The content of every volume is evaluated by supervisors who are asked to do it for each volume. We invite all interested to collaborate with our journal (contact with editor's office). It is possible to subscribe to the print edition as well as order individual volumes of the journal (for more information please contact the publishing house, Wydawnictwo KUL). According to the Act of 26 January 1984 - Prawo prasowe (Press Law), the journal was registered by the District Court in Lublin (the First Civil Division) in the register of journals under item 1305. This journal is open access and licensed under a Creative Commons Attribution 4.0 International License. The journal is co-funded from research funding provided by the Ministry of Science and Higher Education. Contract no. : 711/P-DUN/2018. Name of the task: providing open access to the journal "Studia z Prawa Wyznaniowego". Duration: 1 January 2018 – 31 December 2019.